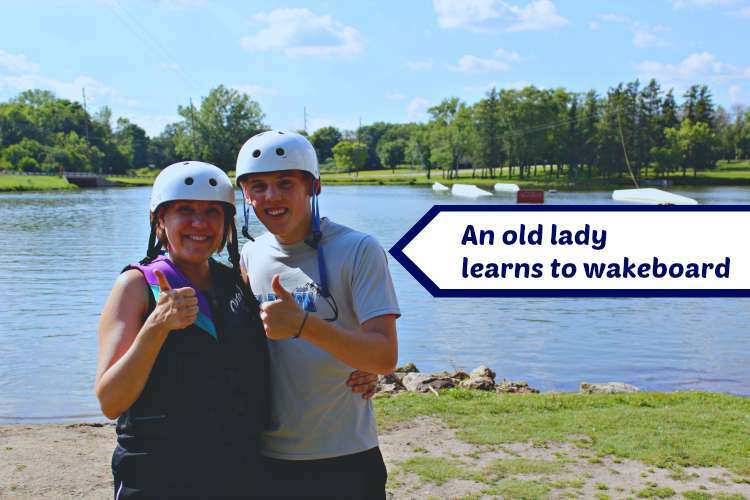 Home » attractions » An old lady learns to wakeboard! An old lady learns to wakeboard! One of the highlights of our Great Illinois Roadtrip was learning to wakeboard at West Rock Wake Park in Rockford, Illinois. Believe it or not, this highlight almost didn’t happen. Scheduled for day 16 of our trip, Ben was getting tired. He’s not used to the travel writer’s pace. I offered to call our host and cut the trip short, but Ben’s a finisher. He said he’d push through and added, “Besides, we drove 1500 miles to get here. It’s not like we’ll be back anytime soon.” I love his rational mind, especially when it works in my favor! So, we prepared with camera, sunscreen, swimsuits and sunglasses. We arrived 15 minutes before our scheduled wakeboard lesson, giving us time to change clothes and sign the ever-necessary consent and release forms. Dan, the visionary and owner of the park, fitted us with life jackets and helmets before giving us our pre-boarding lesson. His best tip: don’t overthink it! He told Ben that moms usually do better than teens first time out, because teens think they know what to do. HAHA! Dan had no idea that this mama comes with the baggage of a law degree — my brain doesn’t know how NOT to think. We headed to the lake to see how well we listened. Because West Rock Wake Park is a cable wakeboard park, there’s no boat required. 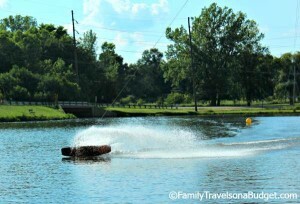 Instead, it uses a power cable system to control the speed and power each wake boarder uses. No wake. No boat. No gas. It’s affordable and environmentally friendly. For this old lady, Dan used minimum power, think slow motion. I’m perfectly okay with that, because I got up! He used more power with Ben so he could turn and “swoosh.” It’s that easy. And he wipes out big! Ben went first. A natural with skate boards and snow boards, I was not at all surprised how easily he took to the sport. I watched with motherly pride as he got to his feet and immediately figured out how to adjust. Then inwardly, I cringed, wondering if I would embarrass myself — or be the first person to die by face plant into the lake. My first try, I didn’t get up. The second and third attempts didn’t go much better. My fourth attempt, I did the unthinkable and face planted. My nose filled with water. Facedown, I struggled to turn over. It’s harder than you think, people. Don’t judge! Dan patiently coached me to grab hold of the cable and use it to leverage myself over. He pulled me in slowly. Yes, I overthought it. Drat! He patiently explained what I did wrong (pulling against the cable line rather than letting it pull me up). Then I tried again. AND I got up. I stayed on my feet the whole run! YAY! Senior Olympics, here I come. Photo provided by Rockford CVB and used with permission. 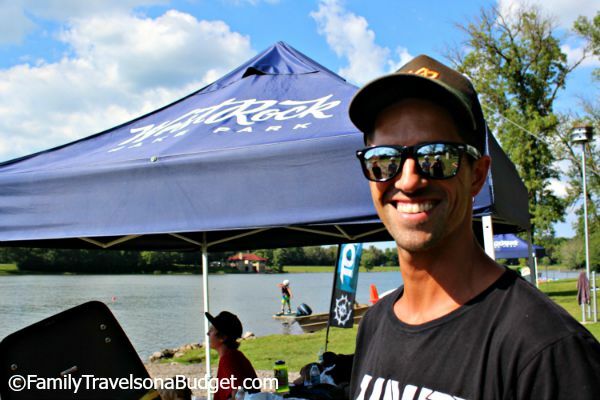 During our session, I learned a couple more cool things about Dan and the West Rock Wakeboard Program. 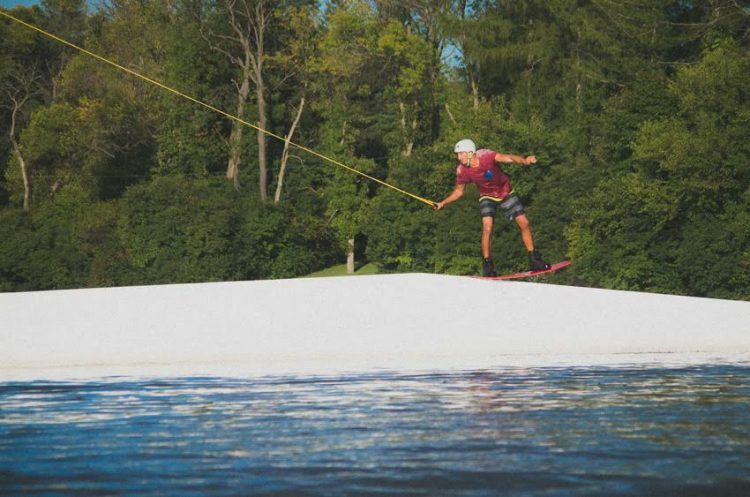 Before opening West Rock, Dan came to my neck of the woods — little old Johnston County, North Carolina — to learn about the cable wake boarding program at our own Hexagon Wake Park. I love a local connection when I’m halfway across the country. Even more cool, West Rock participates in the Rockford Park District “Help Me Play” program. The fund was created to give kids who cannot afford fees to participate in zip lining, snow boarding, golfing, paid admission parks, horse back riding and wake boarding. Isn’t that awesome? The water park, still getting established, is already giving back by participating in a program to reach low income residents. Even better, when Dan told me about it, he simply glowed with excitement to have the opportunity to bring wake boarding to everyone. Photo provided by Rockford CVB. Used with permission. With only 30 wake parks in the United States, most in Texas and Florida, this park offers a unique opportunity in the Midwest. Schedule your wakeboard experience online at West Rock Wake Park. Dan strongly recommends that first timers schedule a 2-hour session. Each boarder shares that time slot with up to three other boarders, all who alternate sessions on the water. I took only one turn (giving Ben my next one) and was worn out after 15 minutes on the water. Ben spent about 40 minutes of the two hours on the water, and he was really sore the next day! A two-hour session is only $30. For beginners, it includes all equipment (wake board, life jacket and helmet). Advanced boarders pay an additional $10 rental for slider boards. 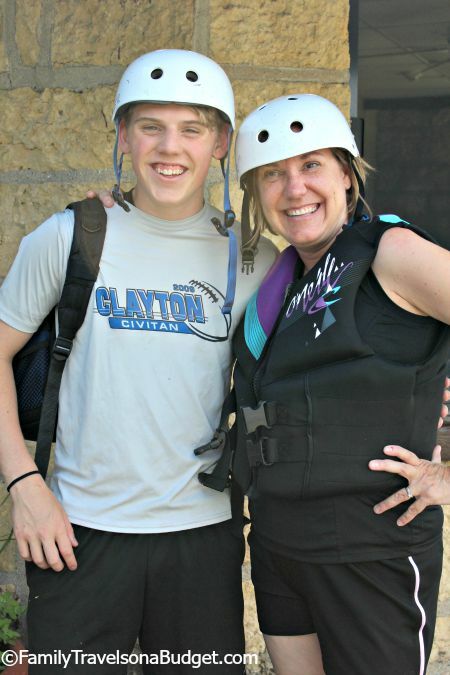 All boarders should arrive at least 15 minutes before their session to complete the waiver forms. 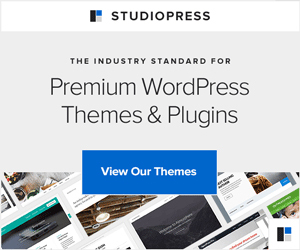 Save time and finish it online before you go. We recommend that you wear a t-shirt over your swimsuit. Ben says board shorts are better than a swimsuit for guys. And… if you face plant like I did, just breathe out when you fall in. It helps. May, September, and October, check Facebook, Instagram, & Twitter to stay up to date on low season hours. When you go, tell Dan I sent you, and say hi from Ben and me. Good for you for learning to wakeboard — and staying on your feet the whole run. That is awesome, and a lot better than I’m sure I could do! My daughter is 11 and couldn’t quite get it when we tried it closer to home. She kept forgetting to straighten her knees once upright and then fell forward. It’s definitely a sport where overthinking is detrimental. Thanks. It is a lot easier than I thought. I’m not ready for the stunt moves yet. This sounds super fun. I know thst I couldn’t personally do it. That is neat that Dan is giving back and helping others. We saw them wake boarding at Sea World and they made it look super easy. They also did those fun jumps too. It is really fun. Before I turned 40 I never would have tried this. Now, I love every new adventurous opportunity I get! Try it!!! Wake boarding is more popular in other parts of the world than here in the US, so far. I think that’s changing as the word gets out here and parks pop up. Super cool you got to wakeboard. I have yet to try that.. It looks really fun. Dominique, you and your husband should go! GREAT unique date activity! I’ll be 50 in March! I’ve done more the last 10 years than the first 40 combined. 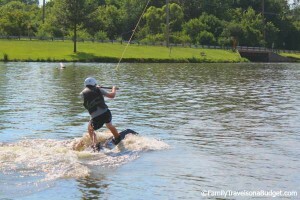 Wake boarding is definitely an adrenaline sport, but there’s plenty of fun for beginners too! It’s so cool that you tried this out! I would probably faceplant a few times too. The nice thing is I was so close to the water, it didn’t hurt. Falling off a skateboard — well, that would have been a different story. I always wanted to try wake boarding but I don’t think I can. I’m a bit scared. Haha. It seems fun though, I’m starting to rethink my choices.